reactions. Activated is sometimes substituted with active. chemical treatment often enhances adsorption properties. restores plating performance to the desired level. arsenic, methanol, ethanol or ethylene glycol. be fatal if immediate medical treatment is not initiated. solutions (5–50%) as mobile phase in analytical or preparative protocols. carbon is in the fourth level (counted from bottom). Activated carbon is also used for the measurement of radon concentration in air. content and significantly increased organic purity, as judged by odor and taste. work in this promising field. 2 stage filtration principle in which activated carbon is embedded inside the filter media. the charcoal particles, while the filtered air passes through. molecules containing unwanted colored organic impurities. carbon is a special product costing more than US$4.00 per kg. Since it is often not recycled, the mercury-laden activated carbon presents a disposal dilemma. warehouses and in deep abandoned mines at an estimated rate of 100 tons per year. disposed of by complete burning, forming carbon dioxide (CO2). in the temperature range of 600–1200 °C. acid, potassium hydroxide, sodium hydroxide, calcium chloride, and zinc chloride 25%). to the lower temperatures and shorter time needed for activating material. A micrograph of activated charcoal (R 1) under bright field illumination on a light microscope. resolution version is at a scale of 6.236 pixels/μm. the activated carbon particles retained on a 50-mesh sieve (0.297 mm). deodorization and separation of components of flow system and is also used in rapid mix basins. 20×40, or 8×30 for liquid phase applications and 4×6, 4×8 or 4×10 for vapor phase applications. makes it preferred for fluidized bed applications such as water filtration. silver loaded activated carbon is used as an adsorbent for purification of domestic water. of activated material, it can be used in a wide range of applications (supercapacitors, odourabsorbers, CBRN defense industry etc.). have even higher surface areas, and are used in special applications. Under an electron microscope, the high surface-area structures of activated carbon are revealed. 80% oxygen if the carbon was first cooled to low temperatures. Physically, activated carbon binds materials by van der Waals force or London dispersion force. Method test) may be used as an indication of total surface area. the gas is undetectable to the human senses, toxic to metabolism and neurotoxic. iodine-131(131I). This property is known as chemisorption. carbon between 900 and 1100 m2/g. It is the standard measure for liquid-phase applications. iodine concentration in the residual filtrate is at a concentration of 0.02 normal (i.e. 0.02N). exhaustion has been determined for the particular application. (range 525–110) is inversely related to the North American molasses number. in parts per million concentration (range 200 ppm–362 ppm). depth of carbon required to reduce the chlorine level of a flowing stream from 5 ppm to 3.5 ppm. A lower half-value length indicates superior performance. typically 400 to 500 kg/m3 (25–31 lbs./cubic foot). carbon. ASTM D 2854 -09 (2014) is used to determine the apparent density of activated carbon. Ash reduces the overall activity of activated carbon and reduces the efficiency of reactivation. The metal oxides (Fe2O3) can leach out of activated carbon resulting in discoloration. 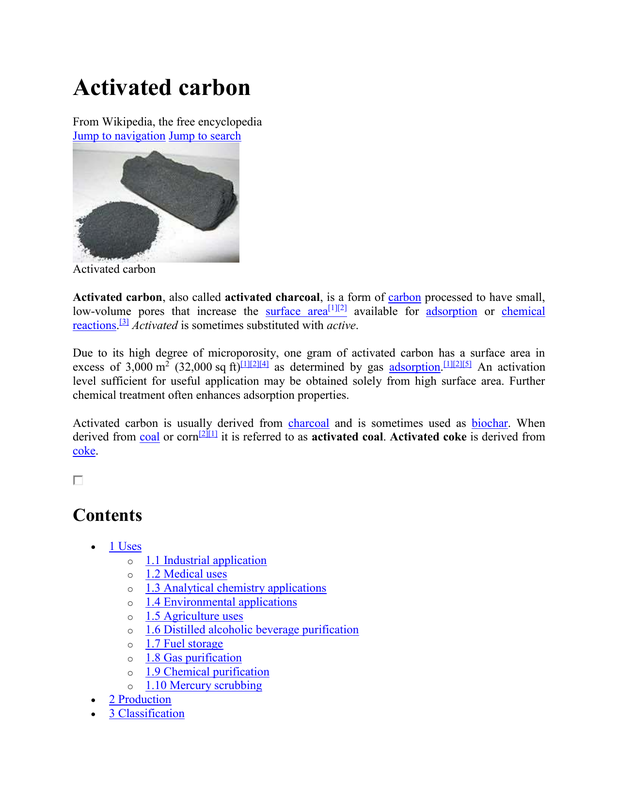 determine the ash content of activated carbon. suitable for elution (the stripping of mineral from an activated carbon). the composition of the surface functional groups. carbon to sorption and other properties can differ significantly from the unmodified forms. Activated carbon can interact with chlorine, bromine and fluorine. carbon with chemically grafted superacid sites –CF2SO3H. surface active carbon double bond. allowing it to undergo reactions that would not normally be available to it. World's largest reactivation plant located in Feluy [fr], Belgium. Activated carbon reactivation center in Roeselare, Belgium. cores to specialised facilities for regeneration.